Kids music has come a long way from just singing nursery rhymes with parents or at school. The musicians today are artists that really know their audience and create special auditory treats just for them! 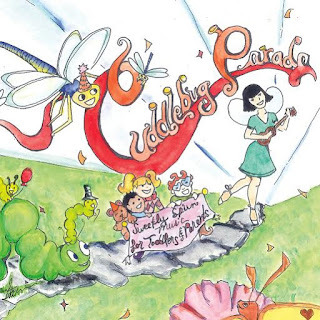 Cuddlebug Parade is a wonderful treat for the younger preschool audience. Performer Michal "Peanut" Karmi has the sweetest voice that will draw your little ones in! Parents and children nationwide will soon become privy to a secret that Los Angeles families already know: independent children's musician Michal "Peanut" Karmi has a one-of-a-kind, magic touch with the very young. With the release of her album, Cuddlebug Parade, Peanut is ready to take her place in the hearts of families throughout the country. Cuddlebug Parade relates beautifully with that expanding universe known as early childhood, effortlessly contributing to the development of a sense of curiosity about the world that will set the pace for knowledge acquisition. Peanut sweetly sings about the joys of playing in the mud, eating colorful vegetables, going to the market, savoring a beautiful day, or just plain being silly. In a nutshell: celebrating things that matter. Tracks:1. Intro2. Hey Mister Mushroom3. Little Bear Blue4. Six Little Pickles5. Ooey Gooey Mud6. In The Pot7. Oh! What a Beautiful Day 8. Stompin' At The Market9. Chew and Swallow10. How Are You Feeling11. Pizzapants12. My Outfit's Not Complete!13. The Big Bug Band14. Abuelita15. To the Stars16. Good Night Sweet Pea17. Where's Your Belly Button18. I love You Anyhow Our Thoughts:I loved how sweet this CD was. Maybe I'm just sentimental - because I'm having another baby in November- but I loved how soft and sweet this album is. Good Night Sweet Pea reminds me of the songs I would sing to my little ones as I rocked them to sleep. I also loved how several songs had multiple languages! For example Abuelita is sung in Spanish and English. This album is perfect for newborn and up! Social Connect: Visit Michal "Peanut" Karmi's website HERE. Michal "Peanut" Karmi on Facebook. Michal "Peanut" Karmi on Twitter. Michal "Peanut" Karmi on YouTube. Michal "Peanut" Karmi on Instagram. Cuddlebug Parade is available at Amazon, CDBaby, Bandcamp, and iTunes. I would listen to it with my grandchildren, who just love music!